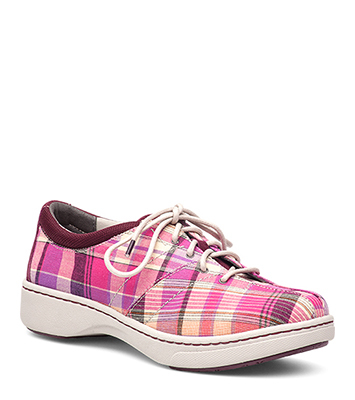 The Dansko Pink Madras from the Brandi collection. As comfortable as it is casual, the Brandi lace-up sneaker sets the scene for your active lifestyle. Features include a removable footbed with arch support and memory foam. The canvas upper is made from a fine cotton fabric which is dyed and woven. Material may be spot cleaned using mild soap and water or clean damp cloth.